Both tourmaline and topaz are available in multiple colors. While no informed gem-seeker would confuse blue tourmaline and rutilated topaz or black tourmaline and the multicolored mystic topaz, red tourmaline and red topaz can appear very similar to the untrained eye. Fortunately, the right tools allow a prospective buyer or lucky discoverer to determine which type of stone he has in hand. Mohs hardness kits and diochroscopes are readily available from jewelers, educational science supply stores and shops that cater to amateur geologists. Look closely at the stone for a yellowish color. Tourmaline doesn't have a yellow tone, while topaz does. If it has a pinkish tone instead, it's tourmaline. Test the hardness of the stone using a Mohs kit. Tourmaline is a 7 to 7.5 on the hardness scale, while topaz is an eight. Scratch the stone in an inconspicuous place with the test material for level 8 in the Mohs kit. If the material scratches the stone, it's tourmaline. If it doesn't, the stone is topaz. Examine the stone through a dichroscope to see which colors blend to create the stone's appearance. If you see red and yellow, it's topaz. 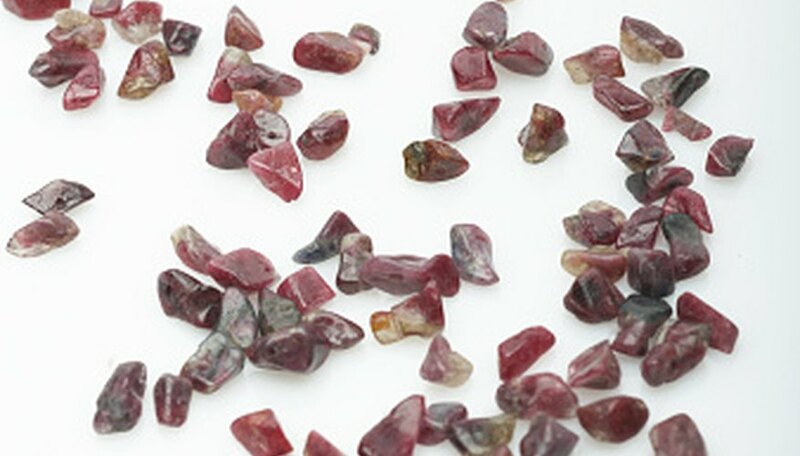 If you see dark red and rose pink, it's tourmaline.